We're back with another review for J.Skinner.. and this time Gerry is doing the review solo, for the danish rings of theirs. We love our baked goods here- and maybe too much I think sometimes. I'm not too much into danishes but Gerry sure loves them. He said J.Skinner's get 3 F's from him for theirs- F for Fresh, F for Flavorful and F for Filling! The danish are fresh/moist, the fillings and toppings are most generous and they sure will provide a filling desert for after meals or coffee time! Gerry tried the Ringin' Raspberry, Cheese Bliss and Caramel Apple Danish. 3 of their 6 flavors. The danish are created with 100 layers of European -style Danish dough. Moist, textured and scrumptious. Read how they create their danish here. 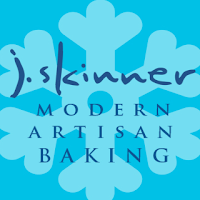 J.Skinner would love one winner to win their own set of 6 delicious flavors! A random draw will be made on December 20, 2016 from all US entries received. Leave a comment for J. Skinner on their products if you have tried. If not, that is okay but we'd love you to look at their web site and pay a visit to see all their great deserts. Also leave us your contact info should you win - we'll need to contact you . I have not tried J. Skinners products, but I want to! I want to try their Cinnamon Cravers Roll! I have not tried their pastries before! I would like to try their Wildly Pecan Danish or their Awesome Almond Danish! I have not tried this, but it looks yummy. The chees danish would be my first choice to try. Ringin' Raspberry is what I would like to try, no I have not tried them before.